Your warehouse is probably facing more and more demand to house the inventory that your customers want. With this increasing demand, it’s important that you make the most of your warehouse space by setting pallet racks in the most efficient way possible. This may mean a complete reorganization of your warehouse, or it could mean making adjustments in aisle width to maximize space and improve efficiency. For many facility managers, it makes the most sense to adjust warehouse aisle width to improve space and flow efficiency. 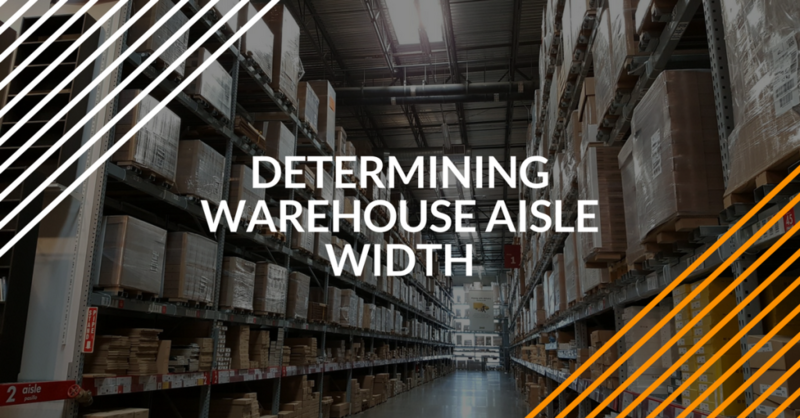 If you are considering making changes to your warehouse layout to improve efficiency and increase space, here are some considerations regarding aisle width that you should consider. When you are thinking about the best ways to increase space in your warehouse, the first thing that you need to think about is the types of aisles that will work best for your space. In general, there are three sizes of aisles that are common in warehouses: conventional, narrow, and very narrow. Each aisle size has its pros and cons, and these should be carefully considered before you go forward with a complete redesign and reorganization of your warehouse. Head Length: The distance from the back of forklift to the front of the back rest of the load. Load Length: The length of the pallet along the stringer, plus the overhang of the load. Maneuvering Space: Add 12 inches to your head and load lengths for maneuvering space, and this will give adequate space for your lifts to turn and stack without difficulty. Pallet Overhang: This is already considered in the calculation of the load length, but it’s helpful to add some space for any additional overhang. Add an additional 6 inches for safety. Conventional Aisles – also known as “wide aisles,” conventional aisles are generally between 12 and 13 feet wide. They are the most frequently used in warehouses because they can accommodate a variety of equipment. It is likely that if your warehouse is a bit older, you are currently dealing with conventional aisles. Conventional aisles work best for standard 48-inch pallets combined with counterbalanced forklifts. Narrow Aisles – Narrow aisles will save you as much as 20 percent of the current space in your warehouse. Narrow aisles are between 8 and 10 feet wide. It is important to understand that if you are not planning on replacing your equipment and only have standard counterbalance lifts, narrow aisles will not work for your warehouse. However, if you’ve reduced the size of your equipment, or are working mostly with hand operated lifts, narrow aisles will allow you to maximize your space and increase storage in your warehouse. Very Narrow Aisles – The narrowest of the options, very narrow aisles can be 6 feet wide or less. The choice to have very narrow aisles is heavily dependent on equipment and operator skill. If you have green operators or older equipment, very narrow aisles aren’t a great idea. Very narrow aisles can increase your floor space by 40 to 50 percent. Which Aisle Type Works Best for Your Warehouse and Equipment? Now that you understand the types of aisles that are common in warehouses, you need to determine the best ones for your warehouse. The best way to make these decisions is based on the type of forklifts and lift trucks that you have on hand. It’s not practical to change the width of your warehouse aisles if your equipment won’t fit. If you are purchasing new equipment or have a variety of equipment options, you have more versatility to how you arrange your warehouse and the width of the aisles you select. Counterbalance, Seated Lift Truck –This piece of equipment requires the most room to move and is only efficient in conventionally sized aisles. These lifts use a 90-degree turning radius. Even the most experienced operators will have trouble maneuvering this piece of equipment in aisles any smaller than 11 feet. These are also the most practical sized aisles for warehouses that are moving larger loads or loads on pallets. Single and Double Reach Trucks – These lifts can easily maneuver narrow width aisles. Your operator is generally standing in these pieces of equipment, and they are good for lighter loads. Popular for loading and unloading trucks, these versatile pieces of equipment can go from your warehouse to your loading dock with ease. The 20 percent increase in space potential will make an investment in a smaller single or double reach truck worth your money. And with a higher reach, these pieces of equipment will allow you to also optimize your warehouse’s vertical storage. Aisle Turret Trucks – The smallest of lifts on the market for warehouses, these tiny workhorses allow you to reduce aisle width to as little as 6 feet. Operator experience comes in handy with these lifts, allowing maneuverability in the tightest of spaces. Also helpful for going from the warehouse to the loading dock, Turret trucks are a great investment for the warehouse that knows they will be growing and increasing inventory. Not only will these little machines increase your available floor space, but with the ability to stack 8 pallets high, your warehouse will gain substantial vertical storage as well. It is important to note that warehouses can benefit from a variety of aisle widths and types of equipment. If your warehouse has inventory that ranges from small to large, you may want to consider investing in more than one type of lift and then creating the most efficient aisle widths for each stock and lift type. If you aren’t ready to invest in new equipment, make sure that you do your legwork by calculating the right aisle width for your equipment, before making changes. For a decision that’s easy to make, leave OSHA-compliant forklift training for your employees to ForkliftCertification.com.